HAMILTON, Ont. -- The New Democrats saw an unchanged seat count in the Ontario election Thursday, but with the Liberals winning a majority government, NDP Leader Andrea Horwath will no longer hold the balance of power in the legislature. Speaking to a crowd of supporters after the results were announced, Horwath was forced to admit the outcome of the vote was disappointing. "I know that many of you here tonight worked so hard and so, so tirelessly and I know that you did an amazing amount of work and I know that perhaps people weren't hoping for this particular result tonight, but New Democrats are fighters and we are going to keep fighting," she said. But Horwath said she had no regrets "whatsoever" for triggering the election by rejecting a budget widely described as NDP friendly. "It was the right decision to make at the time and people now have had their choice and so we will work with that choice," she said. During the 40-day campaign she called the election a "referendum on corruption," hammering the Liberals on various scandals such as the cancellation of two gas plants that could cost more than $1 billion. But voters not only returned the Liberals to power, they gave Premier Kathleen Wynne a majority government. 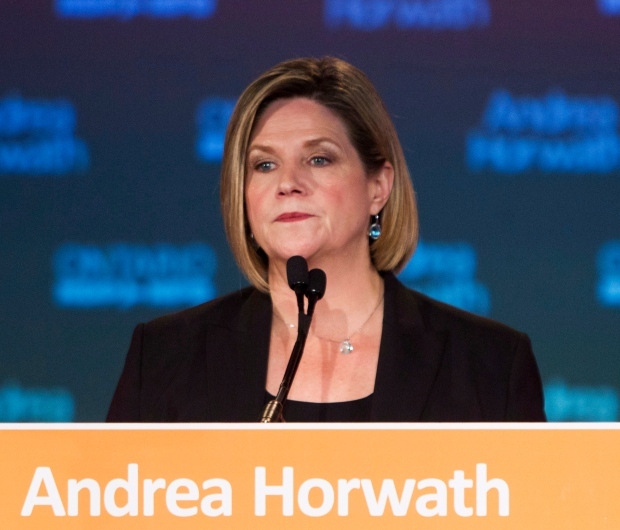 "I think that the people of the province made their choice based on a number of different issues and now that they've made that choice my job is to respect that choice," Horwath said. Wynne's move in the final days of the campaign to target traditional NDP territory in downtown Toronto appears to have paid off, as the New Democrats saw some of those seats fall to the Liberals, including the Trinity-Spadina riding of longtime MPP Rosario Marchese. New Democrats emphasized the seats they did manage to pick up, since Horwath made her own push through non-incumbent ridings. Their candidate in Oshawa, east of Toronto, beat the Tory incumbent and they nabbed seats long held by the Liberals in Windsor and Sudbury. Party staffers insisted the night was an overall win for their party, as they increased their share of the popular vote by about one or two per cent since the 2011 general election. "I'm certainly disappointed to have seen a couple of our downtown Toronto MPPs not return with us," Horwath said. "We've made gains in other parts of the province. What we're going to do is move forward as a strong caucus." Karl Belanger, federal NDP Leader Thomas Mulcair's principal secretary, was on hand at Horwath's campaign headquarters Thursday night and said it was "not a bad night." "You enter a campaign hoping to form government," he said. "When you don't you will be disappointed, obviously, but you have to look at the criteria in which you evaluate these things and the fact is that she increased the share of votes, she connected with more people and people responded well to that." Progressive Conservative Leader Tim Hudak announced Thursday night that he would step down following his party's failure to form government, but Horwath suggested she wouldn't follow suit. "I did a good job as leader of my party," she said. "We did increase our popular support, we grew in other parts of Ontario, which I think is extremely important, but ultimately the work starts when the legislature resumes." Horwath's campaign got off to a slow start, as she waited nearly three weeks to release the NDP platform, which mirrored the Liberal budget in many areas, including transit funding, a caregiver tax credit and promises of a cut in auto insurance rates. Political observers have said Horwath's attempts to make the party more business friendly -- and electable -- alienated the NDP base. In the middle of the campaign, she received an open letter from 34 current and former New Democrats who said they were "angry" that she was straying away from core party values. Her supporters have pointed out that the NDP has gone from 10 seats in the legislature to 21 under Horwath's leadership. "I'm very impressed with how the New Democratic numbers have held given that in mid-campaign the senior leadership of Ms. Horwath's own party turned coat on her, castigated her for poor leadership," said Cristine de Clercy, a political science professor at Western University. "I thought the NDP would have a really hard time with that."